Incorporating a dynamic warm-up into your pre-exercise routine can make a difference between jumping higher, running better, and sprinting faster then your opponent or teammate. As a current soccer and strength coach I unfortunately find it common for some athletes to skip their warm-up routine and jump right into their sport, event, or training program. Regular stretching, specifically a dynamic warm-up, can increase athletic performance. It increases athletic performance by increasing strength and power output, decreasing muscle soreness, decreasing muscle and tendon stiffness, and preventing injury. Therefore as a coach I know that it is my job to enforce and reinforce stretching prior to a sporting event. Stretching consists of many different types; static, passive, ballistic, isometric, proprioceptive neuromuscular facilitation (PNF), and dynamic. The purpose of this article is not to explain all the different types of stretching but to examine what type of stretching is best to use in order to increase athletic performance. Stretching alone, such as static stretching, does not increase athletic performance. This means when performing static stretching you will not increase your heart rate or athletic performance. You will increase the flexibility of your muscles and help increase your overall range of motion around a joint. It should also be noted that static stretching has also been shown to decrease power and force output, which will aid in decreasing athletic performance. Needless to say static stretching cold muscles is not beneficial to the athlete when trying to increase athletic performance. The best warm-up includes dynamic stretching. These types of stretches begin at a slow walking pace and increase to a fast jog. Dynamic stretches allow our joints and muscles to move through their complete range of motion. This allows the elastic properties of the muscle and tendon to increase, while decreasing muscle stiffness and increasing the bodies overall heart rate. An elevated heart rate helps supply blood to the working muscles and if the muscle is less stiff then there is better blood flow to the muscle. Blood is an important contributor to athletic performance because without blood are muscles would not be able to contract and work properly. If our muscles don’t work then we can not jump high, run fast, or maintain our endurance. Blood supplies oxygen and nutrients to our muscles and helps our muscles eliminate lactic acid. If there is too much lactic acid in our body then we fatigue and our athletic ability begins to decrease. Therefore performing dynamic warm-ups prior to exercise will help increase our athletic performance as opposed to static stretches. 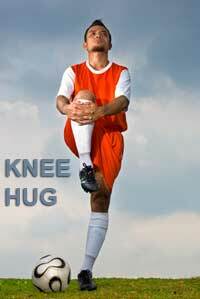 A sample dynamic exercise would be the knee to chest grab AKA the knee hug. During this exercise the athlete flexes at the hip and knee and brings the knee towards their chest. As the knee approaches the chest the athlete hugs and holds the knee while the other leg is straight touching the ground. This movement is completed for 12-15 repetitions and every time the bent leg alternates, so it becomes a walking stretch exercise. When Should I do these Dynamic Stretches? Now that you have a better background on different types of stretching and how to perform some of these exercises. It would be helpful to know when to perform these stretches. The best time to perform these exercises is pre-workout and also post-workout. Ideally a dynamic warm-up is performed to increase muscle temperature, blood flow, oxygen flow, viscoelastic properties of the muscle, tendon, and ligaments, and decrease muscle/tendon stiffness. When all of these factors occur then athletic performance is increased because of better range of movement, higher power output, greater force production and decreased injury rate. Performing a dynamic warm-up post-exercise will help decrease blood flow and heart rate from a high rate to low. This will aid in an active recovery that will help eliminate and decrease blood lactic acid levels. Lower blood lactic acid levels will help decrease delayed onset muscle soreness within the body. One of the most important muscles to a sprinter is called the iliopsoas muscle. This muscle is typically called the hip flexor because it flexes the hip and brings the knee close to the chest. If the iliopsoas (hip flexer) is tight or weak then the sprinter will not be able to flex the hip and bring the knee up high into the chest. Remember in high school physics when you learned Newton’s law that for every reaction there is an opposite and equal reaction? Well in sports this law is important because if we want to go forward quick we need to push backwards into the ground. When we bend and flex our hip up we have to straighten it into the ground and the more we flex our hips and the harder we push into the ground the faster we will accelerate forward. However, if we have tight hip flexors we will not get as much power. Therefore it is important to stretch and perform a dynamic warm-up to lengthen our hip flexors so we can produce more power and force when sprinting. No matter what your physical fitness level is including a dynamic warm-up will help increase your overall function and enhance your athletic ability, while decreasing your injury levels. So all and all stretching is not a bad trade off.